Ahhhh....I see some anxious ladies out there today! I would say this challenge, was super fun, and easy! Can't wait to see what you came up with. Thanks for joining the Spring'tacular with me and the gals. Don't forget the rest of the week to join the other lovely ladies for their party as well. Sharing with Refresh Restyle for her portion of the partay! Love the fun Springtime colors! It's supposed to be warm this week, and I just can't wait to go nuts with some spray paint. Love your table! Thanks for sharing and for hosting this party! Those are so cute and Springy. I can tell it was a gorgeous day when you shot those. Who knew spray painting simple cans could be so stinkin' cute? I love this! Frugal and adorable! Hi Debbie, Love the colors you used on the can. They just scream Sping! I love outdoor photos also. A bit too early here. Loved the pink cherry blossoms. Everything is just lovely! This is such a fun party. I need to link with copycat more often. When do you do it? Looking forward to a Springtactular week! Thanks for letting us share! I can't believe spring is almost here! Of course now that I've gotten used to spring-y weather, it's supposed to rain all week! Thanks for hosting, I linked up two copycat projects! Thanks for hosting Debbie, you CCC is my favorite party. Your cans are just adorable, the bright colors make everything pop. Thank you Debbie. This is always so much fun! It's so fun to set a springtime table! Yours looks great! Love the colored cans! Thanks for hosting! Thanks for hosting one of my very favorite linkies! I went for simple this time, but I love it for its simplicity! Thanks for hosting! Love the colors, you are a great copy cat! Beautiful job! MY favorite too, Debbie!! thanks for hosting a wonderful party, everyone is so talented. those spray paint cans are just adorable!! I tore this page out a while back and have always wanted to recreate it! You did such a wonderful job. I love it to pieces! I think this is my favorite party to visit...I mean I love ALL the parties but I love to see everyone's takes on what they see and copy. LOVE your outdoor shots...you are seriously GOOD with your camera..and get better all the time. Debbie...your pictures are beautiful. I hope to someday learn how to take good pics. Thanks for hosting. Since I am so new at this I didn't go the spring route but wanted to join in anyway. Lovely, Debbie! Really looks like spring there! It's been in the 60's here now, so I think it will be an early spring here this year! I'm not a blogger but have LOVED viewing these copy cats! So fun! ahhhh, this is just beautiful, DebbieDoo.. Your table setting is so pretty, Debbie. It looks really bright and springy. Thanks for hosting! Love the colors...I am ready for spring. Go away snow! Great job as always Debbie. Thanks for hosting. I can't wait to see all the fun copies. Debbie, your copy cat is gorgeous! I love the colors you used and the pictures are amazing! Thank you for hosting this awesome party! Beautifully done, Debbie! I love the colors you chose for the cans. Thanks for hosting & getting us started! I like the colors you used - you really did good! You also did a great job of photographing your project. That is something I need to really work on. Beautiful, Debs! I love the can in all the springy colors! Fresh flowers, ahhh I am so ready for them! Thanks for hosting. I love your version. Those pastel painted cans with the flowers make such a charming centerpiece! Looks like you had weather like ours today. Wasn't it gorgeous? My husband asked me today if there was a place we could move to that had weather like this everyday. Don't I wish! Hi Debbie Dear! Oh, you've done a great job. I love those sweet colors on the cans. I just may have to copy you! Thanks for hosting your party! Your table looks great, Debbie! The painted cans lend such a casual feel. I also love taking pictures outside. I think I very rarely, if ever, have to do any phot editing to those. Yours turned out great - I love seeing all that sunshine. All of the copycats look fabulous. I am going to have to miss this one. :( I was all geared up until faced with a bunch of computer probs this week and just didn't want to participate w/out my best gameface! Thanks for hosting!!! Thanks for hosting Deb, love the colors, I have to try it! I love your Copycat Debbie. Such a beautiful outdoor Spring table! Thanks for hosting! Debbie, that is a gorgeous table!! I love the colors too!! Happy to be linking up finally!! This is such a fun and fabulous idea! I'm in next month! What a pretty copy cat! I even like yours better! Great job Debbie. I love the painted cans used as vases. Well done! I love the cherry blossoms in the background. Spring is near! Thanks for hosting.... and GREAT job on your vases and tablescape. Gorgeous! Spring is comin' round the mountain here she comes! Thanks so much for hosting, Debbie! I love your table with all the pretty little cans of flowers! Hi Debbie! Your springtime tablesetting is very pretty. The cans add such a nice touch of color. Great copycat! I don't have any link today but wanted to see what the others were doing and say HI! Have a terrific week! Hi Debbie, I'm not a regular at your parties, but I do love a challenge, so I'm very pleased to be joining you today for this one. Your copy is wonderful, I love all of the colors in it. Your pictures are gorgeous Debbie. I love those pretty colors, the table looks great. I was out with my sisters so I got to linked up late. Thanks for hosting, I cant wait to visit everyone. Those are so fabulous. I feel like spring time when I look at them. Great job thanks for posting. Hi Debbie! I look forward to this party so much to see all the great copy cat projects. Yours is just great...I am amazed how great painted cans look as a table decoration. Thanks for hosting. I hope to have other posts for the other parties this week too. Everything looks so pretty. The cans are great, a really simple idea, but they have quite an impact. Yay! I've dying for today and ready to see everyone else' goodies! I have always loved this table display and your copy cat version is just as lovely. Monday is a good one for you! Random.org selected you as the winner of the $50 Kirkland's Gift Card. Congratulations! Please email me your address. Absolutely beautiful copycat. So perfect for spring. I'm all linked up. Thanks for hosting such a fun party. Okay, got my link up, Debbie! Thanks for hosting! Your table is sensationally spring-i-fied. :) Love it. 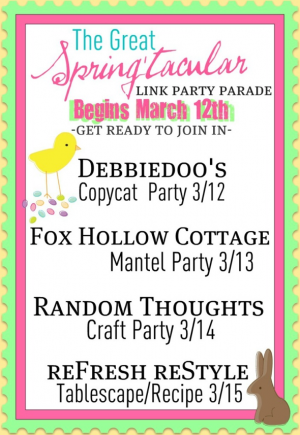 This is my last party with you :( I've hit the newbie benchmarks...but I'll keep stopping by to check out all the links each week! Hi Debbie!! I love your copycat and feel only slightly jealous looking at all that sunshine. ;-) This truly is such a fun party and we are gearing up for joining in all week long! I agree about outdoor photos! it's finally starting to warm up here so I hope to get out and get some! 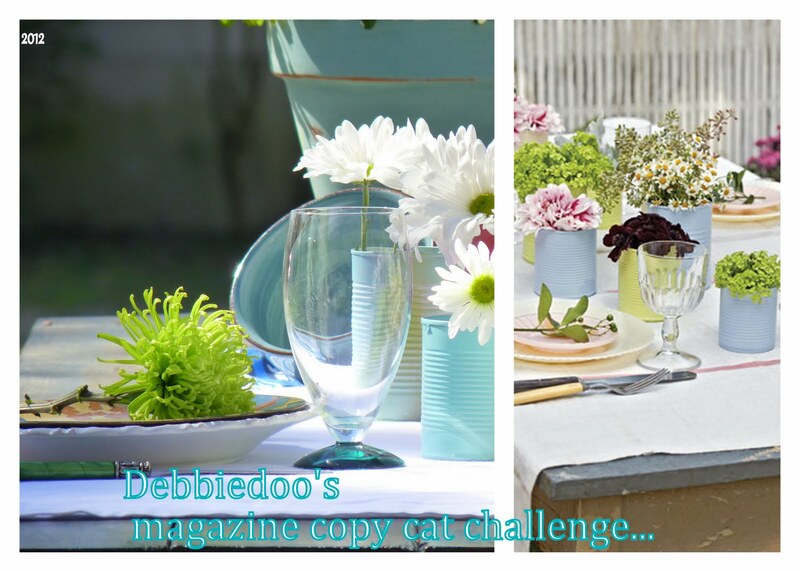 Love your take on your copycat party!! Those cans are so pretty. I did link up but I don't see my link. I'll give it a little time to see if it's just LInky acting up. Such great colors! I adore daisies. I'm saving cans now so I can join you in spray painting. :-) I don't use that many canned goods so it's slow. You're a master my friend at displays & colors! Looks like a fun party too. I think Debbie I am going to have to stop recycling my cans and spray some up for my home. They look so beautiful in the pretty colors and are a very easy thing to do. This is something I am going to have a go at, thanks so much again for reminding me, blessings, Maureen. That's it, I'm going to save my cans and spray paint them. You have so inspired me! What a great inexpensive way to make a fabulous centerpiece! I love it. You will see it on a future tablescape of mine. Love that you always host such great parties. Love your spring look and cans. I copy katted a Simplicity pattern 1933 pillow. Love the painted cans and the outdoor setting. The pollen has already taken over here. Thanks for hosting this fun party, Debbie! I've been dying to participate, but I just haven't had the time to put together the posts before now. Your "can"tainers are really cute! Thank you Debbie for hosting such a fun party. Your table is wonderful. It looks like it was a beautiful day. I'm late! I'm late! For a very important date...but I made it...JUST!! LOVE your copycat challenges! They make me get things DONE that really need it!! Your challenges always look heaps better: LOVE your pops of color!! Happy Spring to you!! Thanks for sharing and co-hosting the Spring'tacular! It's been so much fun! oh how fun & fresh. Crisp springy loveliness!